While the original working draft of Key’s lyric is lost, envelopes were not commonly used in 1814 and then only by the rich for special occasions. Maynard Benjamin’s The History of Envelopes begins in 1840. Instead, letters in Key’s day were written on a sheet of paper that was folded and sealed with wax. Postage was charged by the number of sheets in a letter, so a sheet of postal wrapping would have been both a waste of paper and a waste of money, since it doubled the postal cost. Detained during the battle aboard his own American truce ship—one that would have been amply provisioned for an official U.S. diplomatic mission—Key would have had plenty of blank paper and other writing supplies at hand. He would have planned, for example, for paper and pen to write out an agreement of release for Dr. Beanes, to chronicle his journey, and to write a letter to President Madison about his mission’s fate. He wouldn’t use scrap paper for his report. The notion that Key would have used an envelope or the back of a letter is born of the myth that he was instead held captive aboard a British vessel at the critical moment of inspiration and thus had to improvise his writing materials. Key’s surviving Banner manuscript is a fair copy assembled after he had worked out most (but not all) of the kinks in his lyric. 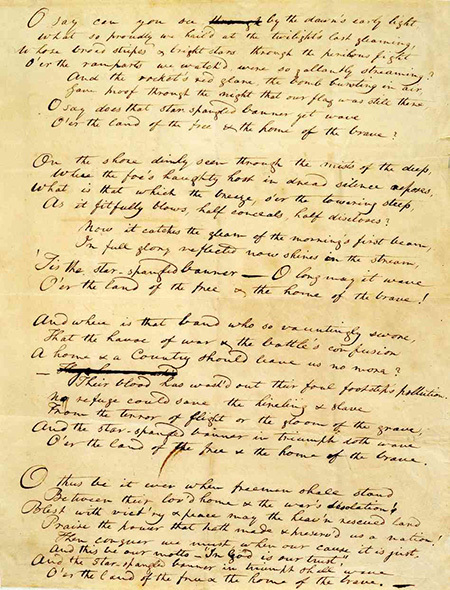 The surviving handwritten final draft of Key’s lyric is held by the Maryland Historical Society (click to view full size). Note that Key ran out of room as he was writing and the fourth verse gets scrunched at the bottom of the page. Even national poets are human! SPANGLED MYTHCONCEPTIONS, by Mark Clague, Ph.D. This entry was posted in Battle of Baltimore, Dr. Beanes, F.S. Key, History, Mark Clague, Mythconceptions, The Anthem. Bookmark the permalink.